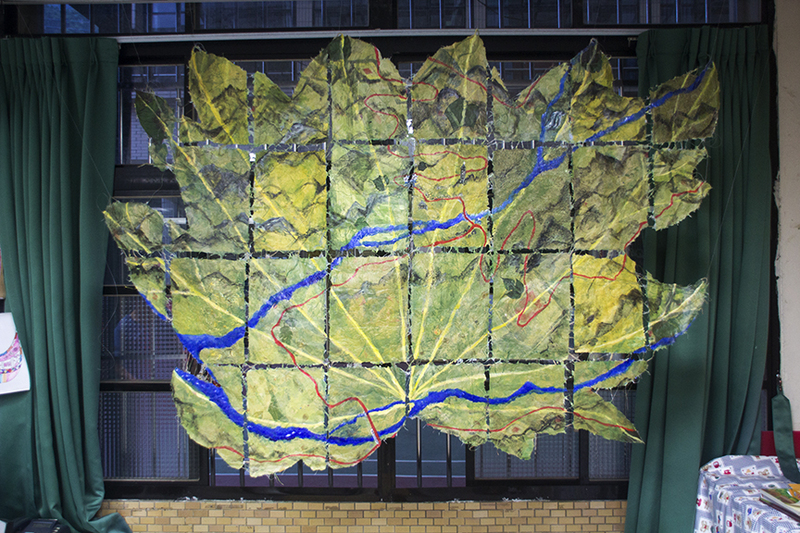 This photo shows my finished Hua Yuan Site Map artwork that was created during the residency using local plants to make the handmade paper and thread created from local plants. HuaYuan Village is in rural Wufeng Township in the mountainous southern part of Hsinchu County, Taiwan. The area is inhabited mostly by aboriginal peoples of the Taiya tribe, and the elementary school has become a sort of cultural center for the community. The school has about 37 students in grades one through 6, and the kindergarten has about 20 students. I worked there for 4 days as an artist in residence with sponsorship by the school and the forestry bureau and the Taiwan Education Bureau and Foreign Affairs Bureau. 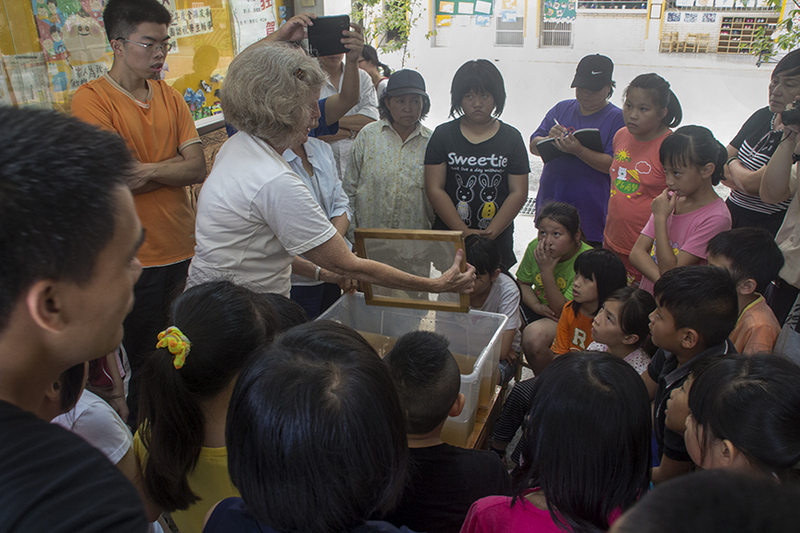 My project was to teach the students and some local adult volunteers about hand papermaking using local plant materials and create a Huayuan Site Map that would celebrate the Tong Cao or the pith paper plant for which this area is known. 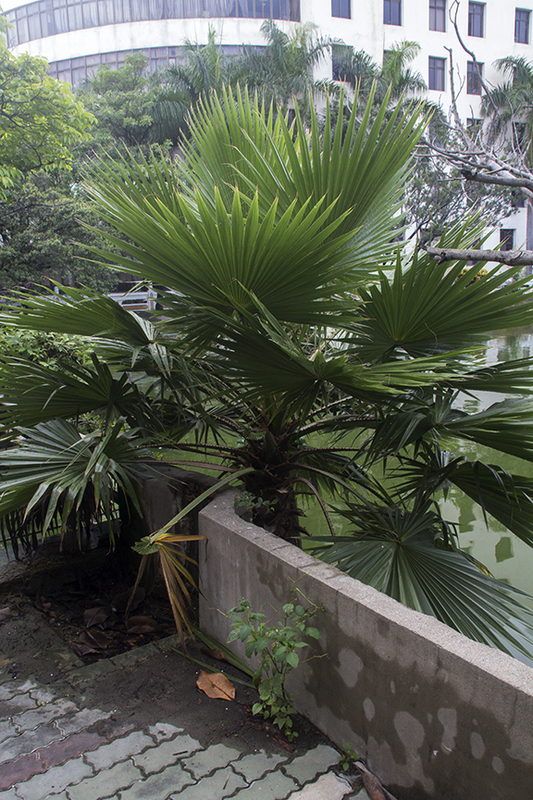 Tong Cao or pith paper is made from the inner stem or pith of the plant Tetrapanax papyrifer. The aboriginal people in this area grew the plant in small farms during the days of the Japanese occupation of Taiwan, and the growing and preparing of this plant for pith paper was a major industry for Hsinchu in this time period, though now it has almost disappeared. Efforts are now being made to revive interest in this plant and its use for crafts such as making artificial flowers and small paintings, and to encourage the local people to grow it again and preserve the culture and heritage of this village. This is a photo of the pith paper plant in Hua Yuan village. My work with handmade paper from the plants of Taiwan has been ongoing since 2004 when I first came to Taiwan with a Fulbright grant. 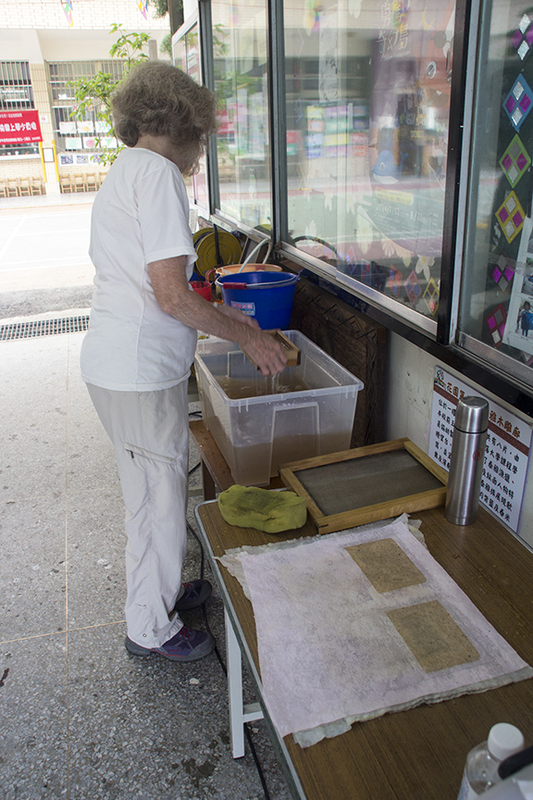 During my two years on the Fulbright grant I traveled to 14 different areas of Taiwan and made handmade paper for my artwork from 135 different plants…but I did not go to Hsinchu. I became familiar with the pith paper plant, but did not have a chance to try it for papermaking. 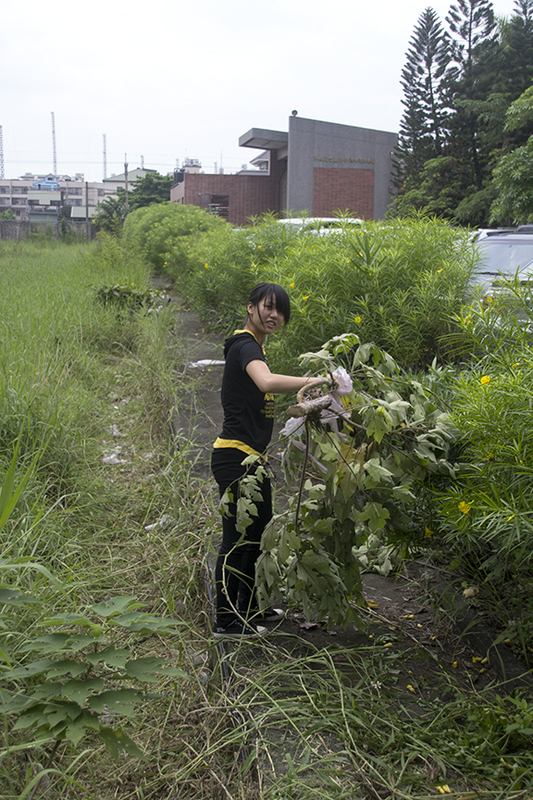 I had experimented with the pith paper for making contemporary artworks in 2010-13 and joined with other Taiwanese nature educators and craftsmen and some foreign artists, papermakers, historians and conservators to start a movement to revive the cultivation and culture of this plant. 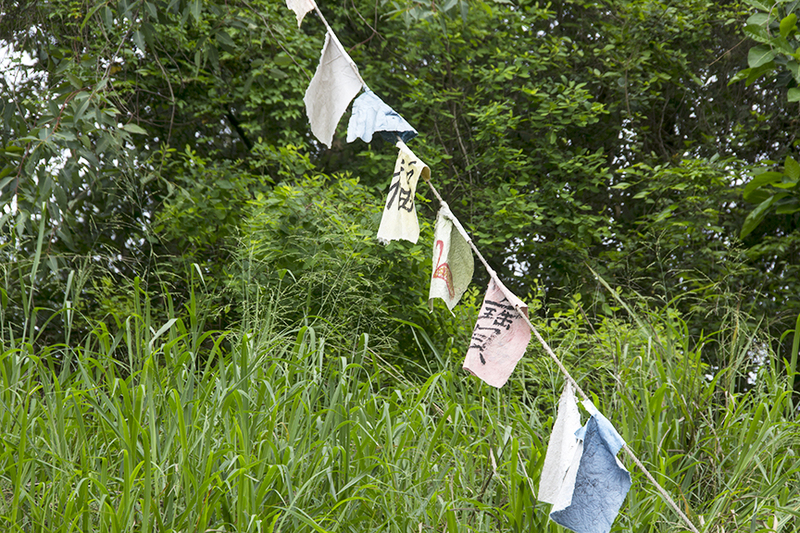 I published an article about the pith paper revival in Taiwan in the magazine Hand Papermaking in Summer 2013 (http://magazine.handpapermaking.org/previous.htm). 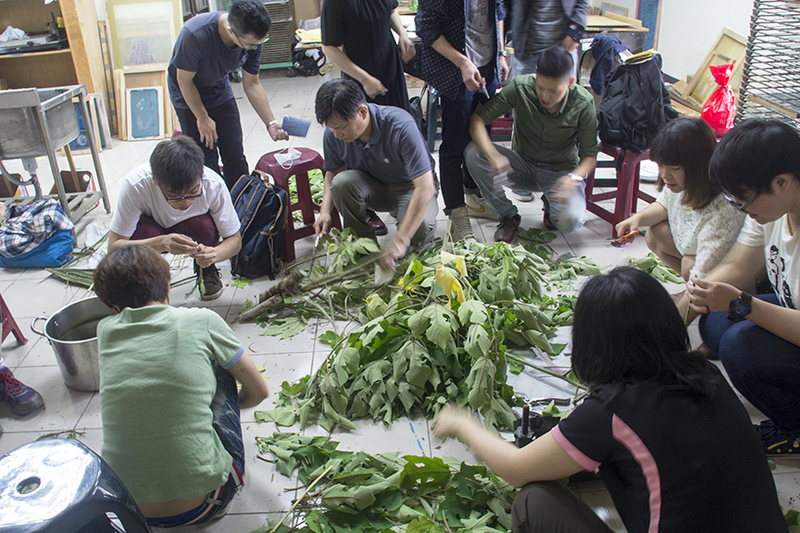 During this artist in residency in Hua Yuan village I worked at the school with some local volunteers and the school children to make handmade paper from local plants: paper mulberry bark, Japanese silvergrass leaves and the bark and leaves of the pith paper plant (Tetrapanax papyrifer or Tong Cao ). The local mulberry bark was a great source of fiber for handmade paper and so was the Japanese silvergrass, but the pith paper outer bark and leaves did not yield any fiber that would make paper. However, this material did work well to make an interesting handmade paper when some mulberry bark pulp and Japanese silvergrass pulp were added with the Pith Paper plant material in the vat. The resulting mixed pulp yielded handmade paper with a unique dark color and interesting rough texture, and I used this paper and the mulberry bark and silvergrass paper to create the Huayuan Site Map artwork. My Huayuan Site Map artwork was composed with sheets of A-4 size handmade paper that I made in my modified Asian technique. The handmade paper sheets were joined with thread made from local plant fibers mixed with some common cotton sewing thread. 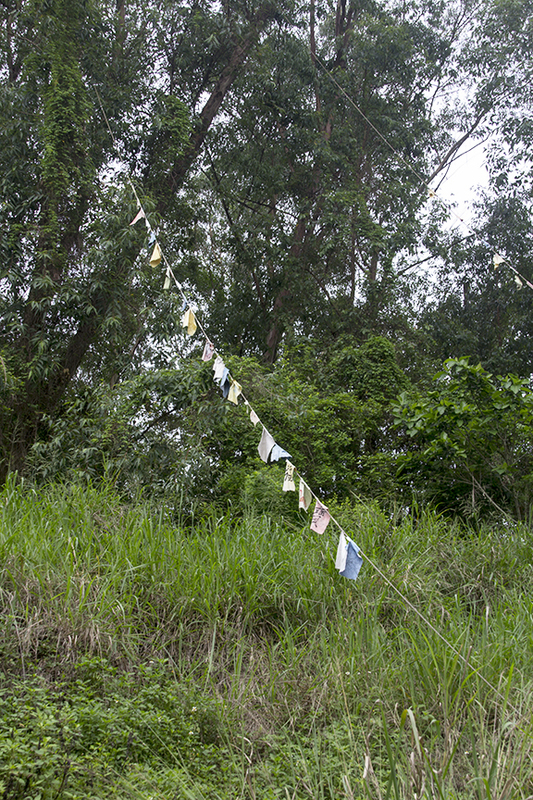 The local plants used for thread were Boehmeria nivea (Ramie or China grass) and Alpinia zerumbet (Shell Ginger). The stems of these plants yield great fiber for thread and rope. 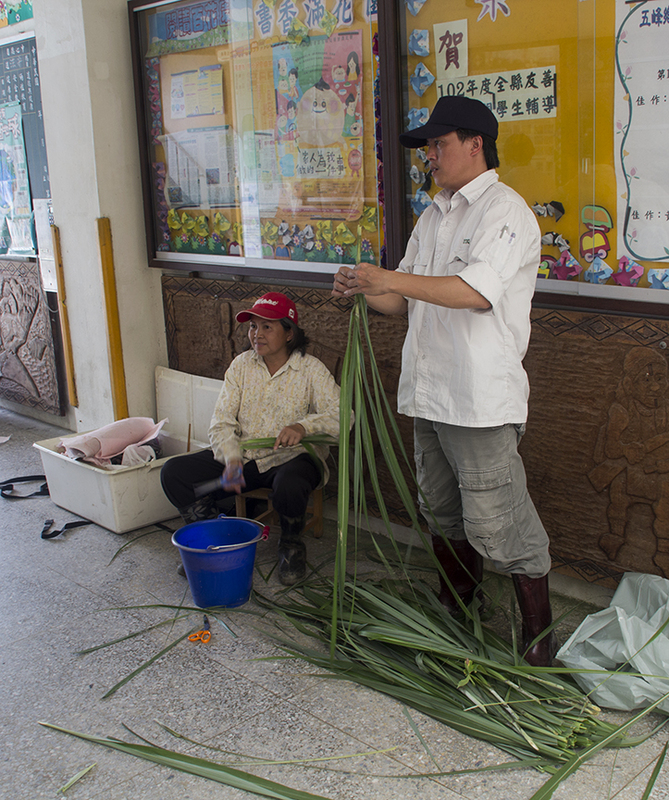 During my residency one of the local men brought his 80-year old mother to the school to show us how to make the thread from the inner bark of stems from the Bohermeria nivea plant. 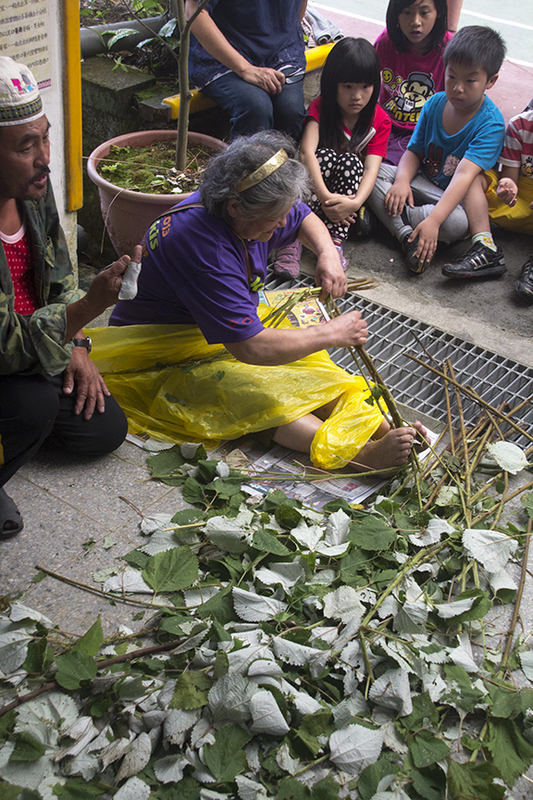 Here is a photo of the aboriginal woman in Hua Yuan taking the outer skin of the Ramie plant to make thread. 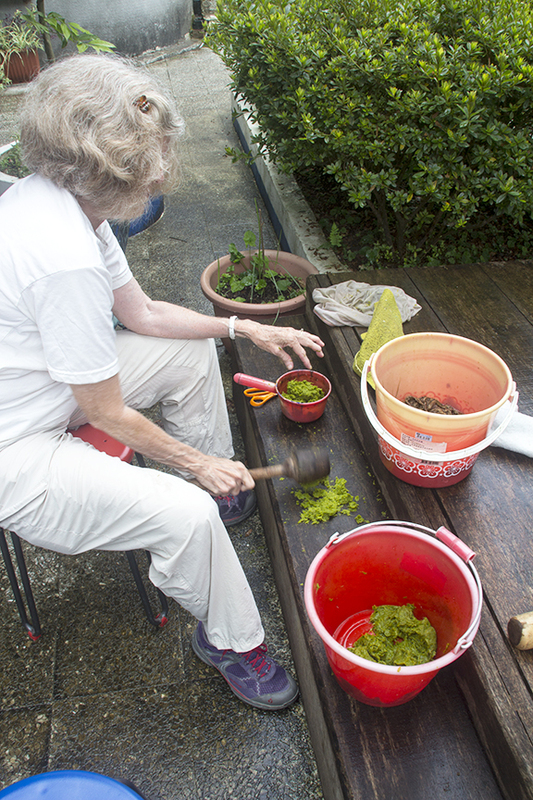 She used a split bamboo piece to scrape the bark and leave only the plant fiber for the thread. I made my HuaYuan Site Map in the shape of the Pith Paper plant leaf. 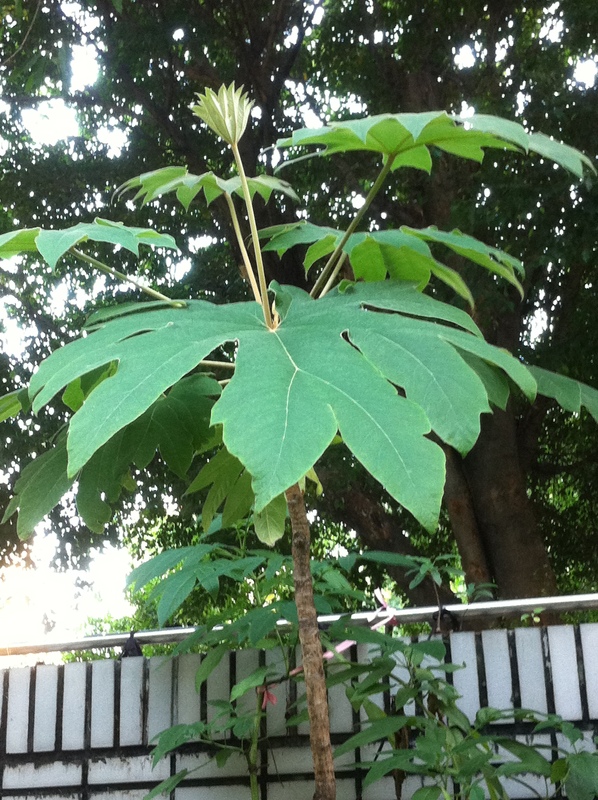 This plant has a huge multi-lobed leaf, and it is up to about 2 feet in size. On one side of my site map I created a map of the area showing the two intersecting rivers and the roads, village houses, school and other important buildings such as the 7 churches. Many sheets of handmade paper created from local plant materials by me, the school children and volunteers were used to create this artwork. On the other side of my site map I included collaged photos of some of the local sites along with painted images representing the local culture. The finished site map was donated to the school and hung for public display in the school. 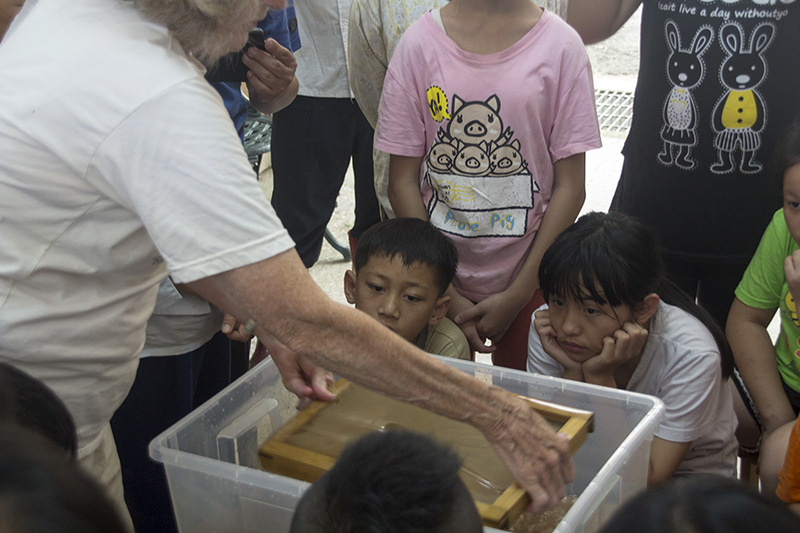 During the residency I taught the local volunteers, teachers and students how to make paper from the local plant materials, and they are planning to continue with the hand papermaking in Hua Yuan village. Although this residency was short, I feel it was very successful in reviving some interest in the pith paper plant and local culture, and it introduced them to another craft (hand papermaking) that can make good use of local natural materials in a sustainable way that will not harm the environment. This is a beautiful natural area of Taiwan with clean air and pure water and has much potential for eco-tourism and introducing people to tribal cultures and raising environmental awareness. 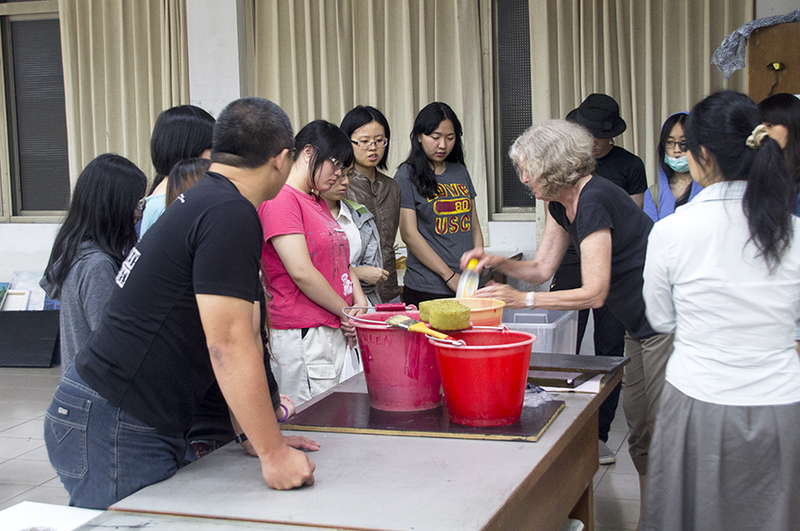 During this two week residency as a visiting art professor at Kun Shan University in Taianan, Taiwan, I taught hand papermaking to the graduate students in Communication Design and also introduced hand papermaking to undergraduate art students at the university. 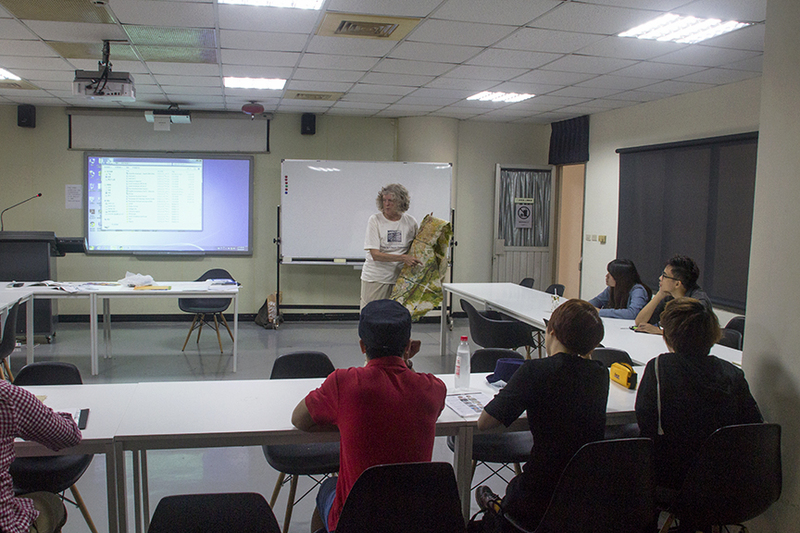 I gave lectures about my handmade paper art and environmental art and conducted hands-on workshops for the students in making handmade paper from local plants that we collected on campus. 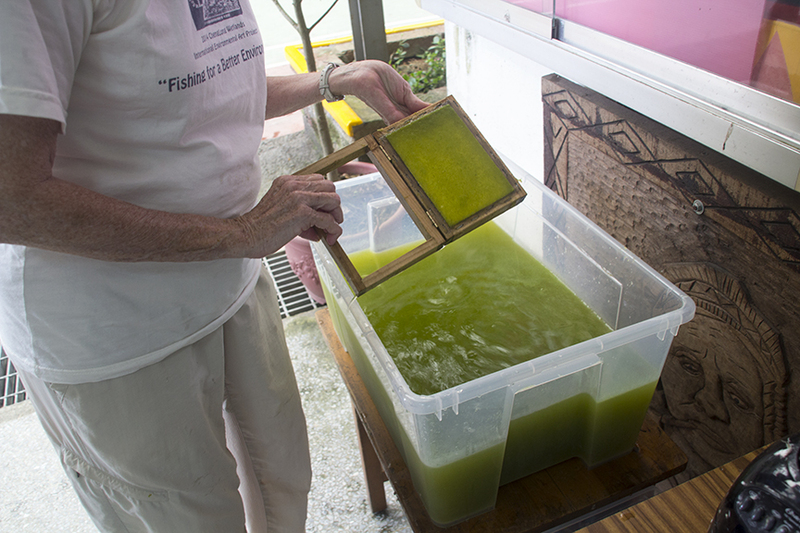 We used paper mulberry bark (Broussonetia papyrifera) and fan palm leaves (Livistona chinensis) to make the paper pulp. 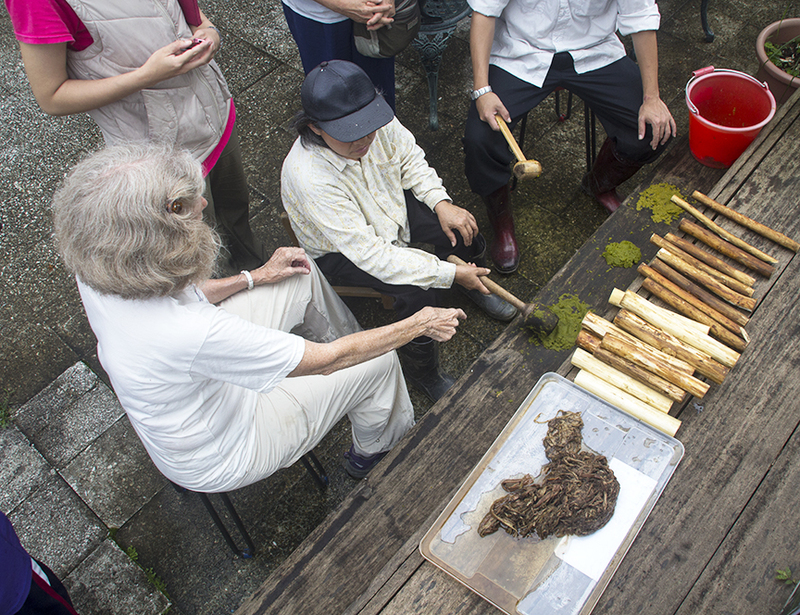 The process included stripping the bark and cutting up the leaves, cooking it in caustic soda, beating by hand and using the blender, and then making the paper in a modified Asian technique using Western style moulds and deckles. 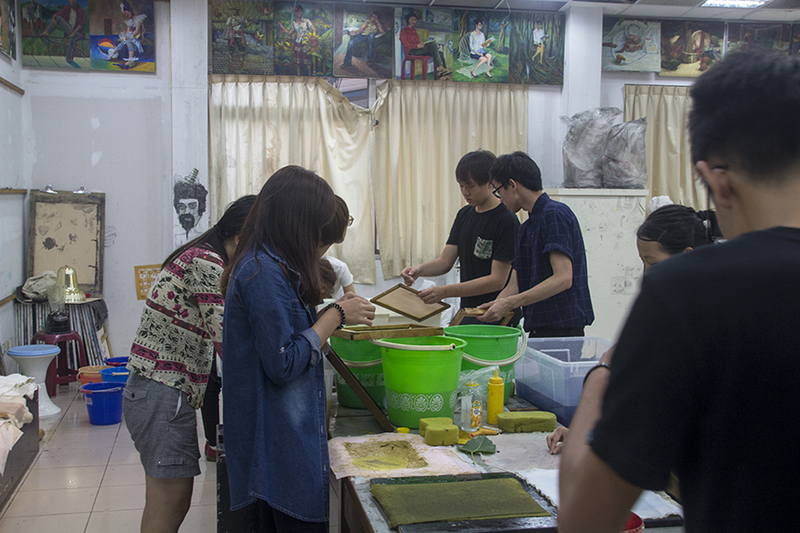 These photos show the students making handmade paper and the process of gathering plants and preparing the pulp from plants on campus, paper mulberry bark and fan palm leaves. The students created their own unique handmade paper artworks to express the time and place using local natural materials combined with mixed media techniques such as collage, painting, drawing and digital photography. It was an interesting two weeks that introduced the students to the use of local natural materials and the art of hand papermaking. I encouraged them to think of using papermaking with technology and digital photography in their future design work. that I have curated in Taiwan since 2010. 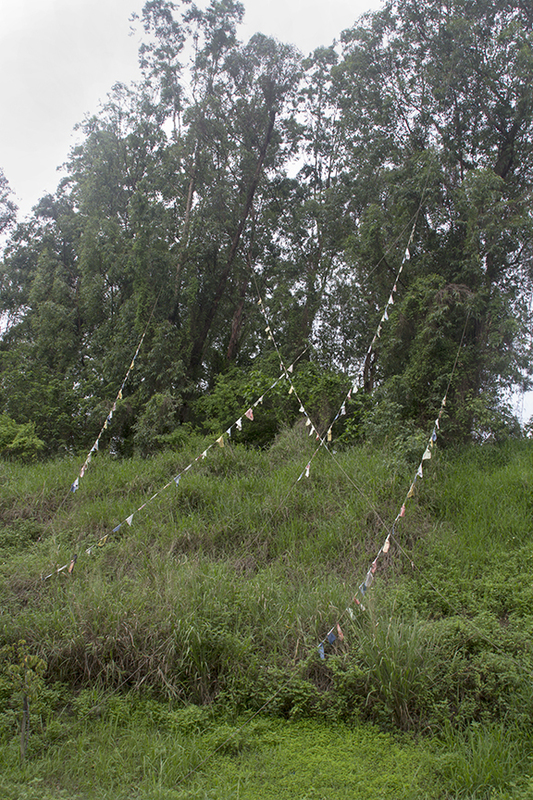 These photographs show how the 250 handmade paper prayer flags created for my “Healing the Earth” installation are surviving after 2 months. 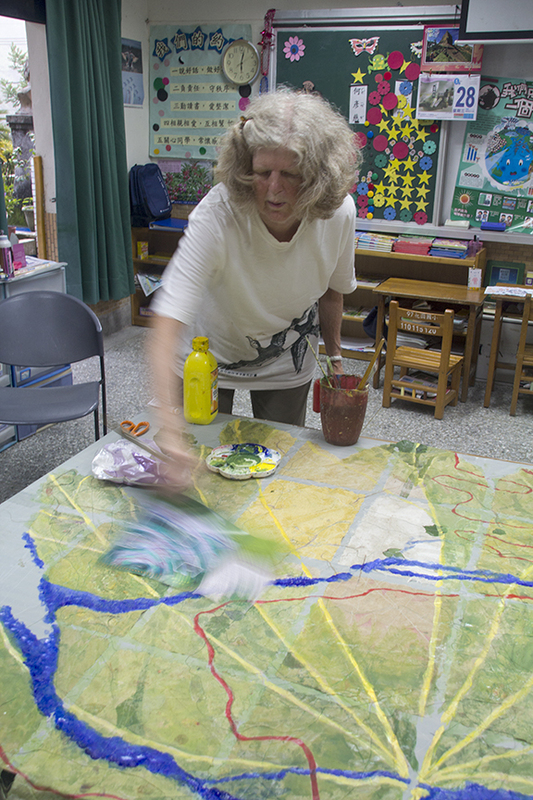 When I returned to Nan Hua University to make a presentation for the school’s International Biodiversity Day celebration on May 23, I had a chance to visit the installation again and see how the artwork was changing over time. The students told me that the weather has been very rainy and windy during the months since the artwork was installed on March 22. It is amazing to see how well the handmade paper has survived. The colors have faded somewhat and some flags have fallen to the ground and been dissolved into compost, but most are still “hanging in there”. The students and I made the paper pulp for the flags from paper mulberry bark and dyed the pulp with liquid fiber reactive dye. The handmade paper sheets were formed on A-4 size Western-style moulds and done in the Asian or Japanese way with multiple dips and using formation aid in the vat. 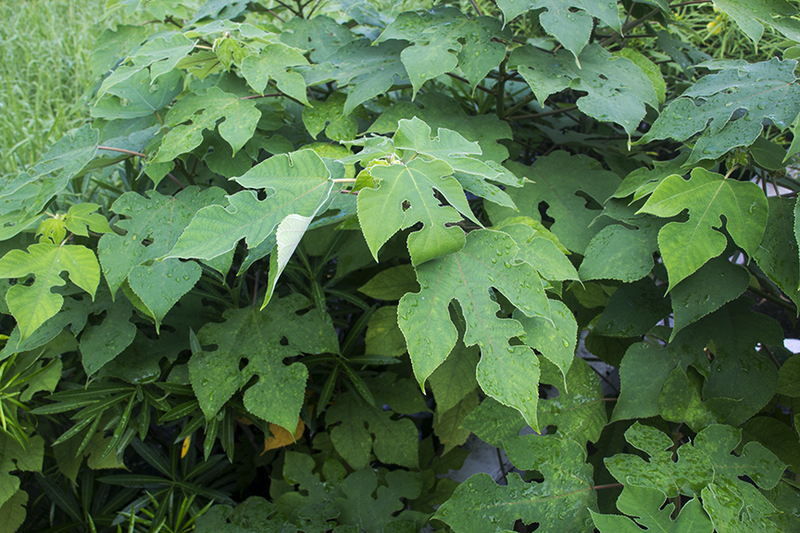 This seems to produce very strong paper that lasts well through wind and heavy rainstorms. 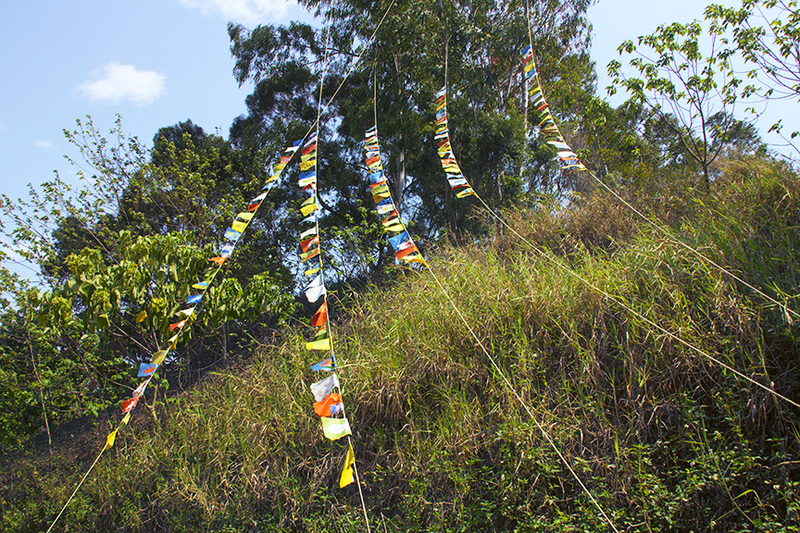 You can see earlier entries on this Blog when the prayer flags installation was first put up and also see photos of the process of creating “Healing the Earth”. I hope the students at Nan Hua University will send some more photos in a few months to show how the installation continues to change over time.